Green is not just the colour of the environment, it is also the colour of money. As another Environment Day comes around on 5 June, you can be sure that our commitment to clean air, green cities and lean living will be confined to token rallies in which school children once again will be dragooned to carry placards along Kathmandu’s roads. In the afternoon, a smattering of ministers will attend half-hearted functions in which they will read meaningless speeches to almost-asleep invitees. And that will be it until the next Environment Day on 5 June 2017. 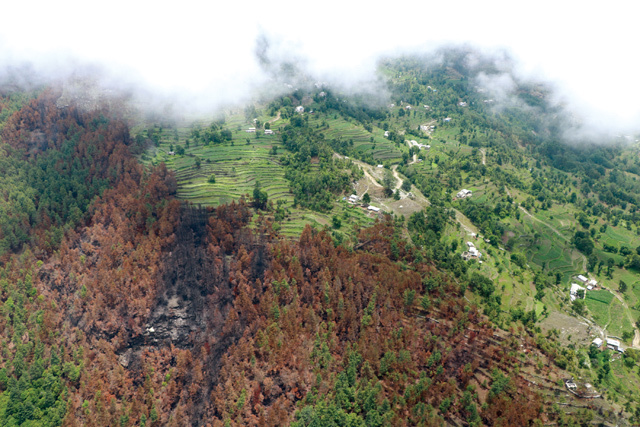 And yet, the past 12 months have been a reminder to us in Nepal that disasters are not only of the earth-shattering kind — there are slow-moving crises like the climate calamity affecting us. It is not as immediately dramatic, but the warming earth is reaching a tipping point with almost certain catastrophic impact on the Himalaya and everything downstream. This year Nepal suffered an unprecedented drought, and the only reason we haven’t heard more about it is that it affected the country’s poorest and remotest mountain districts of the far-west. Entire villages have been abandoned as people move to the cities in search of a means of survival. In central Nepal, the onset of pre-monsoon rains has ended the drought, but springs have dried up because of the subterranean impact of the earthquake on aquifers. In this edition, photographer Kishor Sharma profiles a village in Dhankuta that has no water at all, and where households spend entire days ferrying water up the mountain from the Tamor River. To be sure, droughts are nothing new to Nepal. Monsoons have frequently failed. But there is evidence that climate change is making weather patterns significantly more erratic, leading to extreme rainfall events and prolonging droughts. If successive national governments had been more proactive in rigging up irrigation systems and putting in place drinking water schemes, they would have addressed a chronic problem that has been made far more acute by global warming. Across Nepal, we see that villages with efficient and accountable leadership have been successful at lessening dependence on rain-fed agriculture. Today, they are the ones better able to cope with climate change. Unpredictable weather is only the latest hardship that Nepalis have to face, and has undoubtedly exacerbated all other existing problems markedly. Climate change ‘adaptation’ is now a buzzword for governments, international agencies and NGOs in their fund-raising efforts. But in reality climate change has only brought to the fore existing structural problems of governance that render farmers vulnerable. Then there are the overarching regional problems of longterm water shortages brought about by global warming. As we see in a special report in this issue, over one generation the glaciers in Nepal and Tibet have receded, snowlines have moved up the mountains, and hundreds of lakes have appeared out of nowhere and are in danger of bursting. ICIMOD researchers in Langtang this year observed the thickest spring haze ever. There is reason to believe that not all of the melting of Himalayan glaciers is the result of global emissions, but is also caused by the deposits on the snowfields of soot particles from industries, crop and forest fires. Ironically, the forest fires were more widespread this year because of a prolonged drought, itself induced by global warming. True, snow and ice get all the attention for Himalayan climate scientists, and the reason is that they are so strikingly visible. Weather gets less attention because its correlation with global warming is not yet conclusively proven, so scientists are reluctant to blame greenhouse gases in the atmosphere for the frequency and intensity of storms, droughts or cloudbursts. Climate change overshadows all other crises, and is often seen as a stand-alone problem which has to be ‘mitigated’ or to which people have to ‘adapt’. In fact, the rural poor of the Himalaya have always had to mitigate and adapt, and to cope with the underlying factors keeping them poor. The basis of their vulnerability is political neglect, but the reason they have to leave their homes today is environmental. Archetypal political corruption and patronage that disregards the environment in sand and boulder mining, or in quarrying the Chure make people there poorer. The poor lack choice. If there is no rain, there is no irrigation canal to fall back on. If the springs run dry, they have to vacate their homes. When food runs out, they migrate to India. Nepalis will become increasingly more destitute because climate change will reduce their choices. They lacked options long before anyone knew the globe was warming — they have always had to deal with uncertain weather on their own. Now they also have to adapt to an uncertain climate.